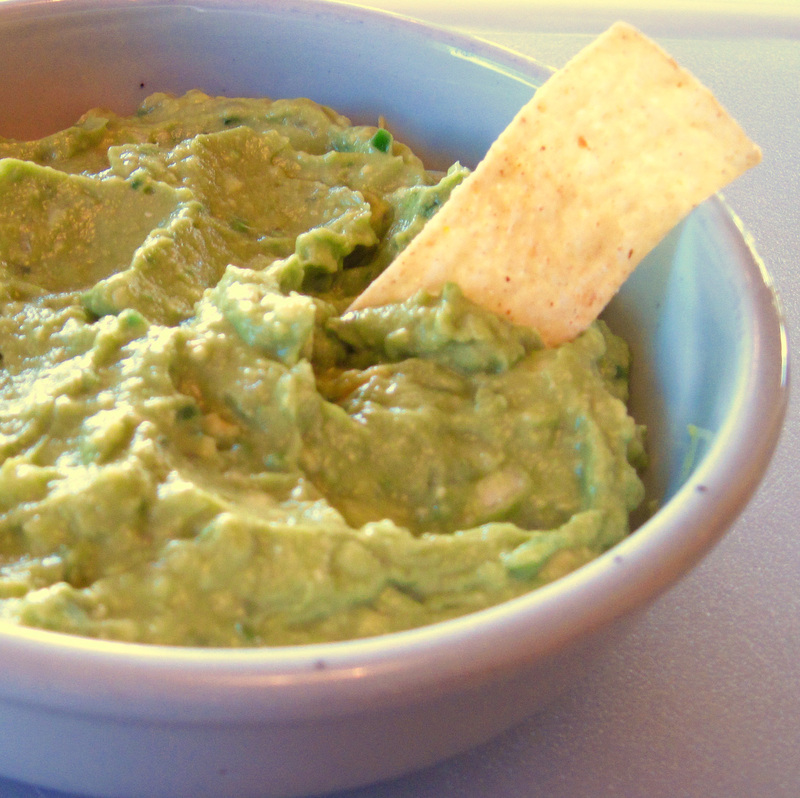 Take two large ripe avocados and turn them into amazing guacamole! This recipe is adapted from the 2004 edition of The Gourmet Cookbook, and I think it is perfect. It has a bit of a kick from the chilis, but the heat isn’t overwhelming. The original recipe calls for 4 avocados. I had 2 avocados, so I cut the recipe in half. It served 6, but barely. The guacamole can be made up to an hour in advance. If you do make it ahead, press a sheet of plastic wrap onto the surface of the guacamole and refrigerate it. 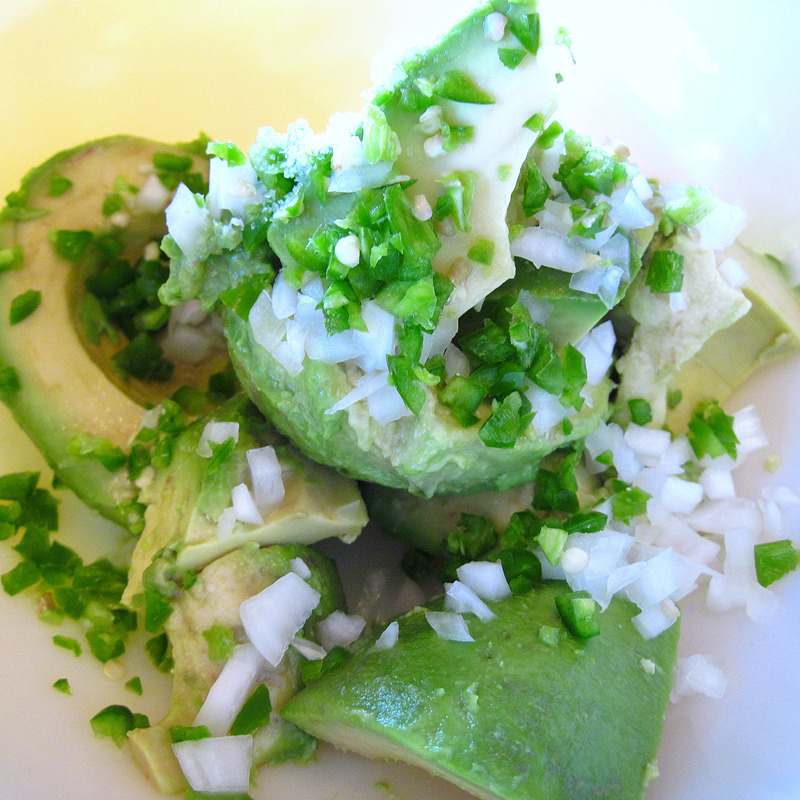 Put the avocados, onion, chiles, lime juice and salt in a bowl. Mash with a fork until it is smooth but still slightly chunky. Serve with tortilla chips. When using hot peppers, like serrano or jalapeno chiles, your fingers will be in contact with the oils that cause the heat, so be sure you don’t touch your face or eyes. If you’re really sensitive, you may want to wear gloves. I don’t use gloves; I just wash my hands well after handling the peppers. Most of the heat is in the seeds and the veins, and many recipes call for removing them. If you wish to remove them, simply cut the top of the pepper off and slice the pepper in half, lengthwise. Then use a teaspoon to scrape out the seeds and the veins. This guacamole recipe suggests leaving the seeds and veins in, which I did, but you can certainly remove them if you want. To mince the peppers, cut the top off of each pepper and then cut the peppers in half lengthwise. Cut each half in thin strips lengthwise. Then hold several strips together and cut into small pieces. After they’re all cut, you can gather them on the cutting board and chop them a bit more for even smaller pieces.